“A fantastic training centre like no other! l visited 5 other training centres before l decided on Goldtrowel and now, after 5 months of trading as a plasterer, I am working on my own and with other spreads. ln my opinion there is no better place to learn - a massive thank you to you all! Well structured, well supported and superbly taught. I am now City & Guilds and NVQ qualified with a steady amount of work and already being recommended by previous clients.
" I recommend the staff for their teaching skills, patience and methodology. They took a bunch of people and taught a skill set in a condensed time providing people with more than adequate knowledge and the confidence to be able to undertake domestic and personal work. There is plenty of hands-on practical experience with 1 on 1 tutoring as required, these tasks were second to none and provided the main frame grounding." 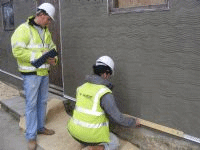 Join plastering, rendering, bricklaying, skimming and plumbing courses with Goldtrowel. Enter the community of construction experts and get involved in new building projects in a rewarding industry. City & Guilds accredited diplomas will make a difference in your work portfolio! Goldtrowel is the leading City & Guilds accredited training centre in the UK that provides national vocational qualification units - NVQ, certificates and diplomas that build upon your professional reputation and career – no matter the level you start your training at. A passion for well-done construction work is all you need to become a skilled expert in bricklaying, plastering, rendering or plumbing. No prior experience is required to attend our courses – the trainers will bring you to a sound ability level that allows you to work independently right away. Choose the construction skills training you need to become a recognised plasterer. Get career support and construction jobs right away! Get a certified training diploma that can serve you to reach a large number of customers throughout the UK! Fill out your details to get in touch with Goldtrowel Plastering and Venetian Marble Plastering Courses and find out more about their courses. Would you like to promote your courses on Findcourses.co.uk and The Independent?